Search by location: Apartments in Indochina Plaza Hanoi - IPH. District: Cau Giay District. Province / City: . 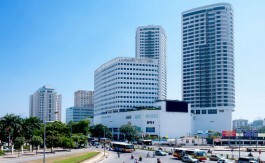 Indochina Plaza Ha Noi – a high-end retail, office and apartment tower is strategically located on Xuan Thuy Street, Cau Giay District, Ha Noi at the connection point between Hanoi’s Central Business District, My Dinh and the main access road to Noi Bai Airport. The project covers 16,619 m2 land area with 11-storey office tower and 2 apartment towers (31 storey and 35 storey) standing above 5-storey retail podium with total net leasable retail area up to 18,003 m2. With the concept of a community shopping center, heavily weighted on F&B and entertainment, IPH shall be one – stop destination for the project’s occupants and surrounding residents. Co-operating with CBRE, the world’s largest commercial real estate services firm, IPH offers premium services for residents. Owning 300 offices in 50 countries and 28 –year experience in asset management industry, global network provides CBRE thought-leading insights and resources to support residents. At IPH, every household experiences the best services including daily cleaning service and round-the-clock security. With over 3500 sq. meters in size, Elite Fitness and Spa at IPH houses a large variety of state of the art strength and cardiovascular equipment installed with touch screen entertainment systems where every member can integrate their Iphone & Ipad, 4 seasons heated indoor pool, well designed class studios with the largest variety of fitness programs and classes of over a hundred per week from Yoga, Spin, Dance and Aerobics. Elite IPH is the first fitness club in Hanoi that provides Cross Core and Radical Fitness classes with International Certified Instructors and the only Club in Vietnam to have an indoor climbing wall. Furthermore, it provides its members with a luxury lounge, juice bar, pro-shop, internet bar facilities, Jacuzzi, spacious locker and dressing area, plus a spa with a wide selection of treatments to compliment any guest work out for a complete fitness and health experience. A high-end spa will complement the gym facilities, providing residents with a wide variety of relaxing and indulgent treatments to help rejuvenate after a long day at work or a rigorous workout. Two rooftop pools are located on the fifth floor podium roof offering excellent views of IPH’s unique open air plaza and H’s charming cityscape. The pools are designed to accommodate the Hanoi climate and lifestyle with an operable wave shaped canopy covering the 25m pool providing shading and shelter for all year round use. Residents are now having exclusive access to a stylish 400 square meter clubhouse and events area located on the fifth floor. This area will be ideal for hosting business related events, private functions or just entertaining friends and family. Sunrise Kidz is the first Pre-school in Vietnam to adopt the internationally recognized Montessori methods and integrating them with traditional Vietnamese culture and heritage coupled with the unrivaled unique nutrition and care of Vietnam. The fifth branch IMSK (International Montessori Sunrise Kidz) located on the third floor of the IPH Building has brought an environment that encourages discovery by designing each classroom with seperate functions: Music, Science, Dancing, Art and the, Montessori room.